For a griddler with the most complete functionality, you are perhaps considering about getting either Cuisinart GR 150 or Cuisinart GR 300. Telling you the truth, they are both 6-in-1 griddlers, allowing maximum flexibility and versatility to cook virtually anything. Even so, Cuisinart GR 300 is being priced a little bit more expensively compared to Cuisinart GR 150. So, why is the price difference? Which one should you go with? 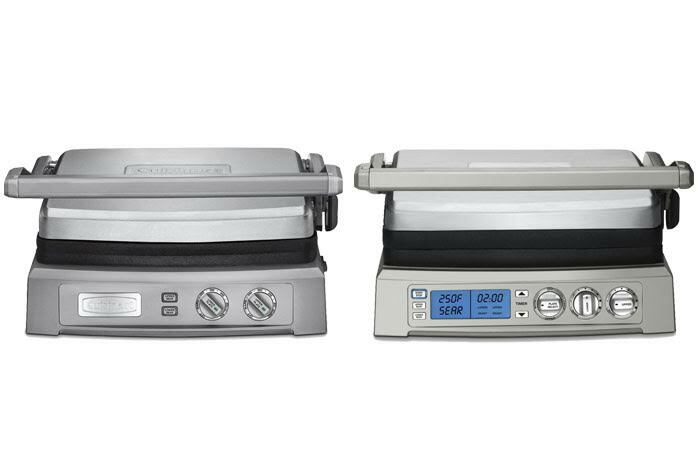 As mentioned above, both Cuisinart GR 150 and Cuisinart GR 300 are 6-in-1 griddlers. They both have the functionality of a full grill, half grill, contact grill, full griddle, panini press, and top melt. So, you can use these devices for cooking a variety of foods, from breads, sandwiches, hamburgers, to even steaks. Each model has an adjustable hinge cover. You can adjust the height of the cover according to the thickness of the food. Well, there are six presets, too, to top melt and to lock for storage. In addition, Cuisinart GR 150 and Cuisinart GR 300 also have the sear function. With the sear function, you can sear the food at up to 500-degree Fahrenheit for up to two minutes at a time. This feature is absolutely very useful for meats and steaks. However, Cuisinart GR 300 also comes with a 60-minute countdown timer that you can use to time your cooking precisely. Overall, Cuisinart GR 300 is a little bit bulkier than Cuisinart GR 150. This is because of the electronic LCD screen. On Cuisinart GR 150, there is no display screen. You use the device by using the control knobs and function buttons. There are, however, red/green indicator lights that can inform you about the operational status. On the other hand, Cuisinart GR 300 comes with a blue LCD screen and blue indicator lights, providing such an intuitive and convenient operation. You can set the temperature and timer as precisely as possible by looking at the display screen. Nevertheless, they each has a total cooking area of 240 square inches. Both models come in brushed stainless steel construction that is very solid, sturdy, and rugged. They each has an integrated drip tray to prevent mess, along with removable and reversible non-stick grill/griddle plates. All parts are dishwasher-safe. As you can see, Cuisinart GR 300 is actually quite similar to Cuisinart GR 150, except for the timer and display screen. If you think you need these two features, you can choose Cuisinart GR 300. If you want to save some bucks, you can choose Cuisinart GR 150 without sacrificing any functionality or performance.